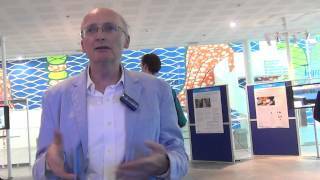 6 Nov 2014 Almere - At the Second National Dutch eScience SymposiumPrimeur Magazinehad the opportunity to interview Henri Bal, Professor in the Department of Computer Science, Computer Systems section in the High Performance Distributed Computing Group at the Free University Amsterdam. Henri Bal is one of the partners in the COMMIT/ Programme, a very large national programme in the Netherlands. It is a collaboration between scientists, profit and non-profit organisations. The goal of COMMIT/ is to perform world-class ICT research. Henri Bal is the leader of one of the COMMIT/ projects, dealing with e-infrastructure virtualization. The project team is trying to make the e-infrastructures easier to use for scientists. Modern infrastructures typically consist of distributed computers and clustered computers with hundred of nodes in different locations and scientists want to use that whole infrastructure for some applications. The clusters also become complicated: they are heterogeneous, they have accelerators including GPUs. The whole infrastructure is powerful but very difficult to use for typical scientists, so that is where the COMMIT/ project is trying to help. A good example are the climate modellers. Henri Bal is working with Professor Henk Dijkstra from Utrecht. Henk Dijkstra is trying to model the climate: the land, the water, the atmosphere and so on. This is extremely computation-intensive. To perform accurate simulations that make sense in real life, Henk Dijkstra needs to combine many supercomputers all over the world, connected by fast networks. This is very complicated to program. Primeur Magazinewanted to know how long the COMMIT/ Programme will run. Henri Bal explained that the whole COMMIT/ Programme runs for about six years. It started three years ago. It just ran through the mid-term review, so it has three more years to go. Primeur Magazineasked whether the industry is also involved. There are some sixty non-scientific partners and they are still increasing, Henri Bal toldPrimeur Magazine. There are many new partners like Infosys, KLM, and many others. Primeur Magazineinformed about how COMMIT/ fits into the e-infrastructures landscape. In COMMIT/, the partners do user-inspired research. Most COMMIT/ participants are PhD students in computer science but they are inspired by applications, for example by climate modelling simulation. In the eScience Center, the goal is to do scientific research and to use ICT as an enabling technology.